Living in and visiting Chicago can get pretty expensive at times. What can we say there is just some awesome stuff in our city! 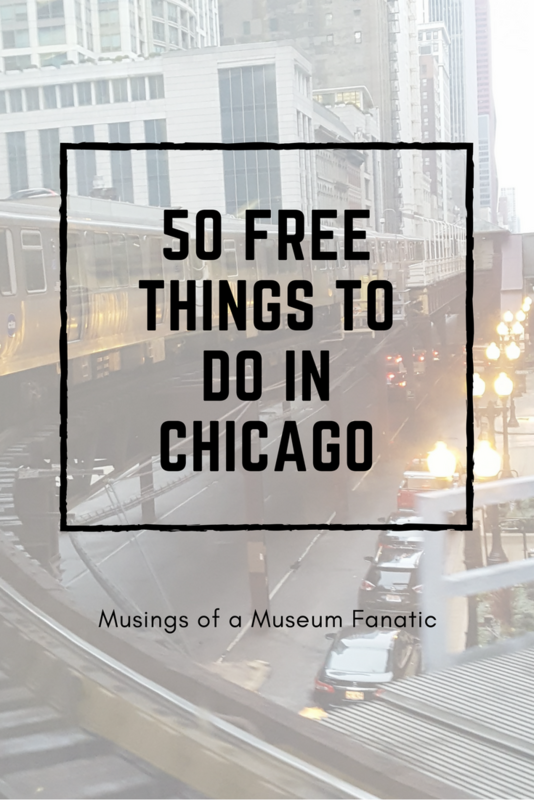 It doesn't always have to be expensive though there are plenty of fun free things to do around Chicago. With the museums I've listed here they're all free museums all the time but for smaller museums it's always lovely to make a donation if you're able to. For the rest of the list head over to Stephanie's blog! There are 77 neighborhoods in Chicago and too many to count suburbs in the greater Chicago area. Each of them has their own story and personality. You can take a trip to another country just by visiting neighborhoods like the very Swedish Andersonville or Greektown in the West Loop. While you'll have to pull out the pocketbook to get a delicious meal there are so many sights to see in these neighborhoods that don't cost a dime. You can sign up before you come to visit Chicago to take a 2-4 hour tour with a volunteer guide for free! Not only will they take you for free you can customize the tour to what neighborhood you'd like to check out plus if you need someone who speaks another language they can hook you up too. The Chicago architecture scene is top notch, we've got beautiful buildings ranging from skyscrapers to bungalow houses. For a lovely stroll to take in the mansion scene there is no better place than the Gold Coast. I always see something new when I check out the beautiful Gold Coast mansions. This is by far my favorite spot for amazing views of the Loop and the Lake. A must stop on any list. Who knows you might even see someone getting proposed to in this favorite romantic pathway. Visiting the Bean is definitely your stereotypical thing to do when you come to Chicago but there is a reason for that! It's free and you get a great Chicago photograph. It's fun to visit the Bean any time of year. You can great photos of a snow covered Loop in the winter. Since there are always tons of people along Michigan Avenue and stores with beautiful window displays this is always a fun one. It's really two freebies on one street! With four different locations, including an indoor market, Green City Market is a perfect visit any time of year. My favorite is seeing all of the fresh produce once spring starts. Take in the sites, smells and sounds of this bustling market. Held every October this fun weekend event allows visitors to check out different architectural treasures located throughout the Chicagoland area. Some of these buildings are open to the public on a regular basis but some are not so this is a fun experience that you can rub into your friends faces until they check it out next year. Building on the same concept as Open House Chicago, the Chicago Area Archivists group has started organizing an Open Archives Chicago event. This year they're putting a twist on it and it seems they're spreading it out throughout the month. I'm hoping this means I can go see twice as many this year! Scheduled for November 18th this year this 25 year running annual festival really kicks of the holiday season. This one might seem a bit odd because usually you have to pay for tours but these days it's so easy to find free audio and self guided tours online all over the place. Here are two that I found that look good, Metrowalkz and Free Tours by Foot. You don't have to pay a ton to get some amazing art in Chicago. Throughout the years the city has made it a point to increase the amount of public art around the city. You'll even find it all along the L line. It's everywhere! Being the flagship Chicago Public Library location you know this South Loop location is going to be spectacular. From the beautiful architecture outside to the massive collections on the inside the Harold Washington has got it going on. My favorite is to take the elevator all the way up to the Winter Garden on the top floor, where there is a gorgeous reading space and exhibits, then take the escalators down so you can see everything. Located on the west side of the city, this is a must visit. Free to the public year round it's the perfect stop when it's cold outside. You can warm up and enjoy the gorgeous gardens. Something is always happening at the Cultural Center. Whether it's a new exhibit or some sort of program. It's always free too. If nothing else stop in to see the amazing architecture of the building and enjoy the beauty of the world's largest Tiffany dome. The Pedway is actually something that not many Chicagoans even know about. It's the perfect way to get out of the cold in the winter and avoid the crowds in the Loop. Take yourself on your own below group Loop tour without even getting cold! A somewhat unknown Chicago gem, this First United Methodist Church chapel that is 23 floors up into the sky is breathtaking. Tours are offered daily at 2pm as well as on Sunday after the worship service. When you think of museums in the Loop the Money Museum is not one that comes to anyone's mind, in fact I bet thousands of people walk by it every day without even realizing it's even at the corner of Jackson & LaSalle. Free to the public but be sure to have your ID since you'll be entering a Federal Building. Be sure to get your bag of $100 when you leave ... shredded that is! During the summer one of a Chicagoan's favorite things is to enjoy the Lakefront Trail. This 18 mile long trail takes you from the very north side of the city to the south, almost to Indiana! So grab your bike, blades or walking shoes and enjoy the gorgeous views along this popular route. This is one Chicago summer staple I've been dying to try. Every Friday, Saturday and Sunday in the summer they break out a 4,900 square foot dance floor in Grant Park for everyone to samba, cha-cha or waltz the night away. Best park is for those of us who might be a little rusty they give you a quick lesson before the open dancing starts! The Grant Park Music seasons goes from June through August. For really good seats you'll have to fork over some money but you'll still be able to enjoy the music if you visit the park. Really there are tons of great free music festivals in Chicago to check out. This new addition to Grant Park is an amazing addition. With a climbing wall, play garden, mini golf and tennis courts just to name a couple of things you can enjoy there is something for everyone in the family of every age and for every season. I might get some flack from Chicago people since this one can been a bit of a pain but it's definitely worth checking out at least once in your life! Taking place every August at North Avenue Beach you see amazing aerial performed by the likes of the U.S. Navy Blue Angels and other such amazing groups. Most people who visit Chicago tend to stay in the Loop and miss out on such south side gems like The Oriental Institute. Located on the University of Chicago campus this museum focuses on Near Eastern civilizations, you won't see some of these artifacts unless you travel to the Middle East. One of my favorites and I'm not just saying it because I was an intern there, it's an amazing museum! This park has gone through several hands throughout it's time but being Chicago’s Municipal Tuberculosis Sanitarium (1915-1970) was definitely it's most infamous. In the 1970s after a bit of a battle the buildings and grounds were converted into the lovely park you see today.